Airflow Sciences Corporation has leveraged its engineering expertise and experience to assist a broad range of clients, in solving their flow related problems. Capture gaseous, liquid, or solid pollutants; optimize flow. Increase efficiency, reduce pollution, ensure compliance. Increase quality, throughput, and uniformity. 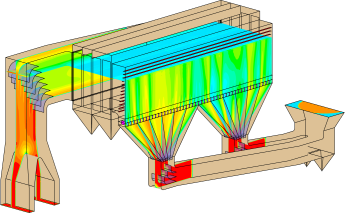 Optimize thermoprocessing operations in furnaces, quenching, and kilns. Reduce drag, improve manufacturing process, optimize flow. Reduce drag and aerodynamic losses, optimize flow uniformity. Reduce aerodynamic losses, prevent tipover, analyze flow patterns of emissions. Optimize performance of calciners, baghouses, scrubbers, cyclones, ESPs, and kilns. Improve ventilation design and maximize pollution control. Optimize air flow for improved cooling capability. Reduce particulate buildup, increase product throughput, optimize processes. Maximize pollution control while maintaining efficient manufacturing process. Optimize air flow and temperature for improved performance. Promote product consistency and maximize line up-time. Understand complex fluid behavior, optimize product design and scale-up.